Wow, lovely, soft, detailed! Beautiful face. That is soooooo amazing!! you are very talented! p.s. all ur works are ever-inspiring. I really love 'em!!! I love all the beautiful colors in the tree's trunk. The girl is so dreamy! I love this. 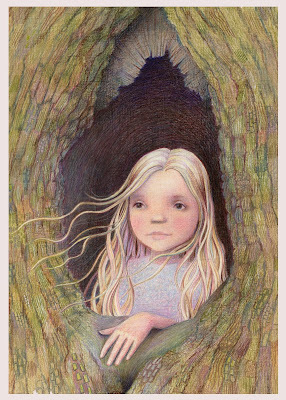 Beautiful illustration--I love her soft, dreamy look, the flowing of her hair and the texture of the tree bark. The whole this is absolutely lovely. Kathy, your work is so pretty. I'm fairly new to IF and have really enjoyed seeing your illustrations. I also enjoyed the interview. Good luck with getting a book to illustrate very soon. Your work is gorgeous. your drawings are very lovely and kind, congratulations! Beautiful work as always! I really love the look on her face and the colours you've used, so much detail.....lovely!!! I love the look on her face! Beautiful! I notice that you put more contrast in your colors and it's great ! beautiful... it's neat to see all the different colors mixed together to make up the textures throughout your pieces! Stunning! I love the softness you achieve with the medium you use. Wow! Congrats it's very beautifully rendered. Kathy, you always bring us the comfort & pleasure to view your illustrations in a different manner and dimensions! This is beautiful. I love all the subtle colors in the bark and interior of the tree. Kathy if I could I would have your pictures all over my house. So, come September, get ready to fall in love like you never have before. PS: The word verification is 'ovennob'. Your work is really so amazing. Everything you do just makes me gasp. I clicked for the larger version and ummmmm escaped my lips. Your art is endlessly moving, sweet and your mix of colors is wonderful. Brilliant work, she looks so peaceful. Love the patterned texture in the bark, looks like it was semi-meditative to render. Beautiful. This is beautiful - love her eyes, hair, and the detail in tree bark. Very nice! how lovely...your talent is inspiring !! Que linda ilustración, mucha belleza, ternura y tienes una tecnica impecable. Gorgeous!!! I so much attracted to her face expression, she definitely in her own mood! Magical, Kathy... What great colors and textures, you have such a beautiful style! She is beautiful Kathy!!! I just adore all that beautiful and delicious color in there! Amazing! She is indeed a character and has a story or two to tell for sure1 great work and thanks so much for stopping by! Absolutely perfect! such emotion! What a nice take on the theme! Your art is stunning - I have just stumbled across your blog and am so glad I came. Off to have a further browse. This one in particular reminds me of my daughter who is now 18 - but this could be her peaking out of this tree. Fabulous piece.